Laboratory experiments, survey experiments, and field experiments occupy a central and growing place in the discipline of political science. 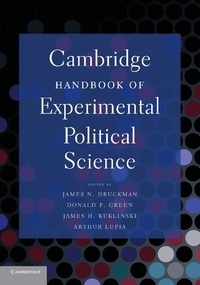 The Cambridge Handbook of Experimental Political Science is the first text to provide a comprehensive overview of how experimental research is transforming the field. Some chapters explain and define core concepts in experimental design and analysis. Other chapters provide an intellectual history of the experimental movement. Throughout the book, leading scholars review groundbreaking research and explain, in personal terms, the growing influence of experimental political science. The Cambridge Handbook of Experimental Political Science provides a collection of insights that can be found nowhere else. Its topics are of interest not just to researchers who are conducting experiments today, but also to researchers who think that experiments can help them make new and important discoveries in political science and beyond.